The kids started school on Aug 18th this year. 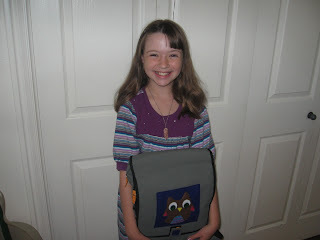 Valerie is holding her backpack that we embellished this year. She was very excited to make the owl. 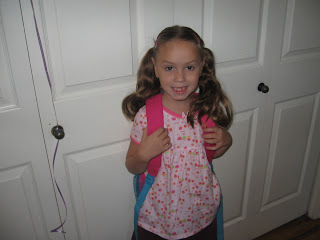 Ella started 1st grade and goes all day now. She likes to eat lunch at school now. She seems so young to me to be in 1st grade. I don't remember thinking that about Valerie when she went to 1st. 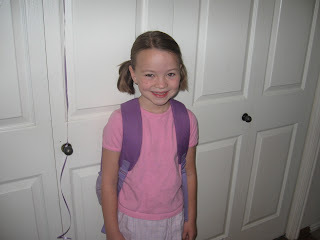 I can't believe that Valerie is in 5th grade now, because the 5th graders seemed so old a few years ago. She gets to memorize states/capitols this year. Liz, maybe you could teach her the song or something. I never learned the state song when I was in school. Scarlett is now in 3rd grade and seems to like her new teacher. All the girls are in dual immersion spanish/english and the teachers are all using a 1 week in english, 1 week in spanish program this year. (well maybe not the 1st graders, I can't remember what her teacher said). We have back to school night tonight, so I guess we will get better details then. Dante is going to start a preschool next week 2 times a week in the morning. I am excited for that as well. I think he will have a great time learning, playing with kids his own age, and I definitely will keep busy while he is away. I'm excited to be able to go volunteer at the school without having to find a baby sitter. I actually learned the song from the Animaniacs! You should look it up on you tube or something. It really helps the memory to know a song! Yeah, that's the link she's talking about - fun and helpful!